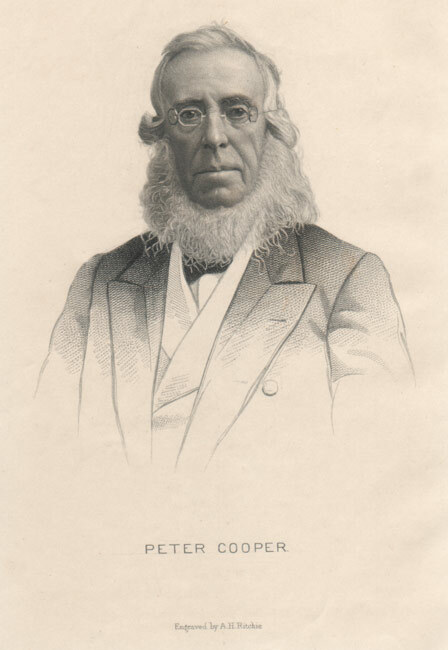 Introduction: In 1877 Prof. J.C. Zachos, Curator at the Cooper Union, New York, edited a small volume entitled The Political and Financial Opinions of Peter Cooper, with an Autobiography of His Early Life. One chapter records Peter Cooper’s oral history of his involvement with Cyrus Field in laying the Atlantic Cables. That section of the book is reproduced here. 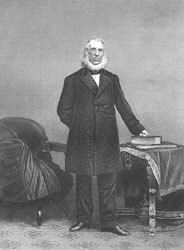 A very interesting episode in Mr. Cooper’s life was the interest he took, and the personal efforts he made in behalf of that most important and difficult of modern enterprises, the laying of an ocean cable. It is not too much to say, that to the perseverance, energy, and unconquerable faith of Mr. Cooper and two or three others, whom he mentions, we owe that great gift to modern progress and civilization. “It is now twenty years since I became the President of the North American Telegraph Company, when it controlled more than one half of all the lines then in the country; also President of the New York, Newfoundland, and London Telegraph Company. “An attempt had been made to put a line of telegraph across Newfoundland, on which some work had been done. Cyrus W. Field, Moses Taylor, Marshal O. Roberts, Wilson G. Hunt, and myself completed that work across the island of Newfoundland, and then laid a cable across the Gulf of St. Lawrence, intending it as the beginning of a line from Europe to America by telegraphic communication. After one form of difficulty after another had been surmounted, we found that more than ten years had passed before we got a cent in return, and we had been spending money the whole time. We lost the first cable laid, which cost some three or four hundred thousand dollars, at the Gulf of St. Lawrence, which loss was occasioned by the seeming determination of the captain of the ship that towed our vessel across the Gulf to have his own way, in opposition to the directions of Mr. Buchanan, who directed him to keep a certain flag in sight as far as he could see it, in connection with a certain mark on the top of a mountain, which was visible nearly half way across the Gulf. “We had hired a vessel at seven hundred and fifty dollars a day, and we directed the steamer Adger to go to Cape Ray, and tow the vessel across the Gulf, in order to lay the cable. We went to Port Basque, and found the vessel had not arrived. We accordingly anchored in Port Basque until she did arrive, which was two days later. On her arrival, the captain was directed to take our vessel in tow, and carry her up to Cape Ray, where we had already prepared a telegraph house, from which to commence laying the cable. On this telegraph house we placed a flagstaff, which was to be kept in line by the steamer, as she crossed the Gulf, with a certain very excellent landmark on the top of a mountain some three, four, or five miles distant - a landmark which seemed to be made on purpose for our use. “We had an accident at starting. We joined the ends of the cable and brought one end into the telegraph house, and made everything ready to take the vessel in tow. The captain was then directed to bring his steamer in line, take the vessel in tow, and carry her across the Gulf. In doing that he ran his steamer into the vessel, carried away her shrouds and quarter-rail, and almost ruined our enterprise the first thing, dragging the cable over the stern of the vessel with such force as to break the connection; and we were obliged to cut the cable and splice it again. The captain of the steamer had failed entirely in trying to get hold of the vessel; and after we had mended the cable, and got everything ready for a second attempt, he was again ordered to take the vessel in tow. We had provided ourselves with two large cables, two hundred feet long and four inches in diameter, as towlines, so as to be sure of having sufficient strength to tow the vessel in all kinds of weather; but the captain of the steamer so managed matters, in his second attempt to take the vessel in tow, as to get this cable entangled in the steamer’s wheel, and he hallooed to the captain of the vessel to let his cable slip, in order to get this unentangled. At this, the captain of the vessel let go his cable and lost his anchor and one of our big cables, for we had to cut it, in order to disentangle it from the wheel. After that was got loose there was the vessel without an anchor, and she was going rapidly down upon a reef of rocks, with a strong wind against her. It was only with the greatest difficulty that we could get the captain of the Adger to go to her relief, and save her from being dashed on the rocks, with her forty men on board. We had to expostulate with the captain of the steamer until the vessel was within two or three hundred feet of the rocks, before he would consent to attempt her rescue; and by the merest good luck, we got out a rope to her and saved her from going on the rocks, when she was so close to the shore that we could almost have thrown a line there. “The captain of the steamer, however, got hold of the vessel at last, and brought her back to her place in the harbor, where we had to renew the connection of our cable, and prepare again to start. “The third attempt to take hold of the vessel was successful, and on a beautiful morning we started to lay the cable across the Gulf. “In a very little while I discovered that we were getting out of line with the marks that the captain had been directed to steer by. As President of the line, I called the matter to the attention of the captain. The answer I got was: ‘I know how to steer my ship; I steer by my compass.’ It went on a little while longer, and finding that he was still going farther out of the line, I called his attention to the fact again, and so on, again and again, for some time, until he had got some eight or ten miles out of the line. I then said to him, ‘Captain, we shall have to hold you responsible for the loss of this cable!’ We got a lawyer on board to draw up a paper to present to him, stating that we should hold him responsible for the loss of the cable, as he had not obeyed the orders of Mr. Buchanan, as agreed on. After we had served this paper upon him, he turned the course of his ship; and went just as far from the line in the other direction. He had also agreed not to let his vessel go more than a mile and a half an hour, as it was impossible, under the circumstances, to pay out the cable faster than a mile and a half an hour. It was discovered, however, that he was running his vessel faster and faster, while Mr. Buchanan hallooed, ‘Slower! slower!’ until finally the captain got a kink in the cable, and was obliged to stop. This happened several times. “So much delay took place that when it was late in the afternoon, we had not laid over forty miles of the cable out of the eighty miles that we had to go in crossing the Gulf. Then a very severe gale came up, and raged with such violence that the steamer Victoria, which was a small one, came near being swamped; and in order to save that vessel, and the forty men on board of her, we were compelled to cut the cable. “Subsequently, we sent a vessel to take up that part of the cable; and it was then found that we had payed out twenty-four miles of cable, and had gone only nine miles from shore! We had spent so much money, and lost so much time, that it was very vexatious to us to have our enterprise defeated in the way it was, by the stupidity and obstinacy of one man. This man was one of the rebels that fired the first guns upon Fort Sumter. The poor fellow is now dead. “Having lost this cable, we ordered another and had it ready in a year or two. This time we had a good man to put it down, and we had no trouble with it. “The great question then came up: What could we do about an ocean cable? 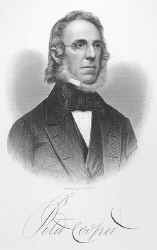 After getting a few subscriptions here, which did not amount to much, we sent Mr. Field across the ocean, to see if he could get the balance of the subscriptions in England; and he succeeded, to the astonishment of almost everybody, because we had been set down as crazy people, spending our money as if it had been water. Mr. Field succeeded in getting the amount wanted, and in contracting for a cable. It was put on two ships which were to meet in mid-ocean. They did meet, joined the two ends of the cable, and laid it down successfully. We brought our end to Newfoundland, where we received over it some four hundred messages. Very soon after it started, however, we found it began to fail, and it grew weaker and weaker, until at length it could not be understood any more. 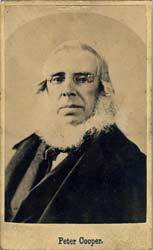 “It so happened that the few messages that we received over the cable were important to the English Government; for it had arranged to transport a large number of soldiers from Canada to China, in the war with the Chinese, and just before the transports were to make sail a telegram came stating that peace was declared. This inspired the people of England with confidence in our final success. This occurred just before the Crystal Palace burned down, and we had a meeting in the Crystal Palace to celebrate the great triumph of having received and sent messages across the ocean. Our triumph was short-lived, for it was only a few days after that the cable had so weakened in transmitting that it could no longer be understood. “One-half the people did not now believe that we had ever had any messages across the cable. It was all a humbug, they thought. In the Chamber of Commerce the question came up about a telegraph line, and a man got up and said: ‘It is all a humbug! No message ever came over!’ At that, Mr. Cunard arose, and said that ‘the gentleman did not know what he was talking about, and had no right to say what he had, and that he himself had sent messages and got the answers. “Mr. Cunard was a positive witness; he had been on the spot; and the man must have felt ‘slim ‘ at the result of his attempt to cast ridicule on men whose efforts, if unsuccessful, were at least not unworthy of praise. “We succeeded in getting another cable, but when we had got it about halfway over, we lost that as well. Then the question seemed hopeless. We thought for a long time that our money was all lost. The matter rested some two years before anything more was done. My friend Mr. Wilson G. Hunt, used to talk to me often about it; for we had brought him into the Board some two or three years before. He said he did not feel much interest in it, but he felt concerned about spending so much money; and he remarked that he was not sure, as we had spent so much money already about the telegraph line, but that we had better spend a little more. So we sent Mr. Field out again. We bad spent so much money already, it was ‘like pulling teeth’ out of Roberts and Taylor to get more money from them; but we got up the sum necessary to send Mr. Field out. “When he arrived there, Mr. Field said they laughed at him for thinking of getting up another cable. They said that they thought the thing was dead enough, and buried deep enough in the ocean to satisfy anybody. But Mr. Field was not satisfied. Finally he got hold of an old Quaker friend, who was a very rich man, and he so completely electrified him with the idea of the work, that he put three or four hundred thousand dollars into it immediately to lay another cable, and in fourteen days after Mr. Field had got that man’s name, he had the whole amount of subscriptions made up, six millions of dollars. “The cable was made and put down, and it worked successfully. We then went out to see if we could not pick up the other one. The balance of the lost cable was on board the ship. The cable was found, picked up, and joined to the rest and this wonder of the world was accomplished. I do not think that feat is surpassed by any other human achievement. The cable was taken out of water, two and a half miles deep, in mid-ocean. It was pulled up three times, before it was saved. They got it up just far enough to see it, and it would go down again, and they would have to do the work over again. They used up all their coal, and spent ten or twelve days in ‘hooking’ for the cable before it was finally caught. But they succeeded; the two ends of the cable were brought in connection, and then we had two complete cables across the ocean. “In taking up the first cable the cause of the failure was discovered. It originated in the manufacture of the cable. In passing the cable into the vat provided for it, where it was intended to lie under water all the time, until put aboard the ship, the workmen neglected to keep the water at all times over the cable; and on one occasion, when the sun shone very hotly down into this vat where the cable was lying uncovered, its rays melted the gutta percha, so that the copper wire inside, sunk down against the outer covering. I have a piece of the cable which shows just how it occurred. The first cable that was laid would have been a perfect success, if it had not been for that error in manufacturing it. The copper wire sagged down against the outside covering, and there was just a thin layer of gutta percha to prevent it from coming in contact with the water. In building the first cables their philosophy was not so well understood as it is now; and so, when the cable began to fail, they increased the power of the battery; and it is supposed that a spark of the electricity came in contact with water, and the electricity passed off into the water. see this page at the Ringwood Manor website.